The first of the Academy Series novels by Jack McDevitt, The Engines of God explores the future of space travel and exploration as humankind searches the stars for extraterrestrial worlds capable of supporting life. The Earth has been ravaged and the environment is no longer sustainable. Academy superluminal pilot Priscilla "Hutch" Hutchins leads a team of exo-archaeologists to the planet Quraqua to investigate the former civilization's ruins found there before the planet is terraformed. In the course of events, Hutch makes a connection between the ruins on Quraqua and magnificent monuments found on other worlds, which leads them to the edge of the galaxy and a meeting with the Monument-Makers - and a mystery holding the potential secret to human survival. 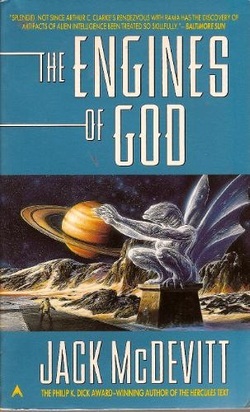 The Engines of God was an okay book. I was actually expecting more from McDevitt after I finished Deepsix and loved it. Priscilla "Hutch" Hutchins starts out the story by picking up a group of xenoarchaeologists on the about-to-be-terraformed planet Quraqua. The group is rushing to obtain one last artifact that may help them decipher the long-dead inhabitants' language when massive nuclear explosions detonate at the planet's poles - the first step toward successfully changing the climate of the planet. In the rush to escape a massive tidal wave caused by the terraformers' efforts, Hutch loses a dear friend. Several years later, in her personal quest to uncover a connection between the artifacts found on Quraqua and its moon and mysterious monuments that have been found on different worlds throughout the galactic area, Hutch undertakes a new mission to the planet Beta Pacifica III. This planet may, they surmise, have been the Monument-Makers' world, and they hope to find someone still alive. But when they reach the planet, a collision with a giant alien array cripples the ship, and the nearest vessel has to come to their rescue - that of the leader of the terraforming group on Quraqua who set off the explosions that killed Hutch's friend. In the course of events (which I won't detail further due to spoilers), the group finds mysterious clouds of unknown origin and composition, which may spell doom for all civilized life this side of the galactic core. The plot was good for TEoG, but what I really found lacking was the character development of Hutchins and company. There was so much that could have been done better in the interplay between Hutch and Truscott (the Quraqua terraforming leader) and honestly, it would have been much nicer if McDevitt hadn't killed off a couple people so early in the story. As for the mysterious clouds... well, not much is said about them. The sequel to TEoG is called Omega, which tells a story about the clouds themselves, and presumably we find out more there, but even the cliffhangers at the end of TEoG aren't very cliffhanger-y. Among the four McDevitt books I've read so far, this was my least favorite, but I'll read Omega soon. Maybe the continuation of the story arc with the clouds will change my perspective. 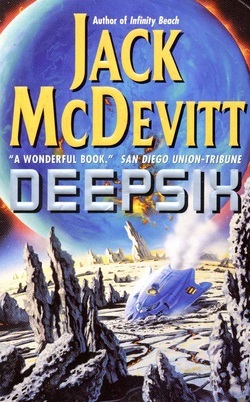 I finished reading Deepsix by Jack McDevitt on 4/19/2013. I recently finished up with his novels Time Travelers Never Die and Chindi and I'm sort of working randomly through the others in his sci-fi series. This novel tells the story of the planet Maleiva III, which is a rare, life-supporting planet discovered by humans, and which has a gas giant hurtling towards it about to collide. The novel's main character, Priscilla "Hutch" Hutchins leads a team of scientists to the planet to get as much data about the life there as possible before the inevitable apocalypse. In true dramatic fashion, the group ends up stranded on the planet and has to find a way off while surviving the hostile environment and life forms there. Deepsix was a very excellent sci-fi apocalypse novel. Hutch leads a group of five survivors of an unfortunate accident on Maleiva III, otherwise known as Deepsix, in which their two landers are both destroyed in an earthquake as the planet starts to break apart before it is hurled into the atmosphere of an approaching gas giant, the planet Morgan's World. Hutch and her three passengers, Kellie - another pilot, Gregory MacAllister - a notorious critic of pretty much everything and famous author, and Mr. Nightingale - the man who first attempted to explore Deepsix. Through a series of trials and tribulations trying to reach Nightingale's stranded and crashed lander from 20 years prior, including animal attacks, earthquakes, hurricane force winds, and one particularly hungry psychotropic plant, Hutch and the team struggle to get off the surface while also playing the part of hurried archaeologists to discover something about the planet's former sentient race of creatures - and a mysterious "skyhook" floating above the planet's atmosphere. In parallel to the efforts of the ground team, no less than four spaceships, including a broadcast news crew, a luxury space yacht, and a pair of "superluminals" attempt to devise a way to get the group off the surface with no landers and time running short. The one thing they do have? Brainpower - the world's foremost scientific minds have gathered to watch the galactic collision of the millennium and gather data on the event, and they must now put their talents to the test. My recommendation is that if you're a fan of sci-fi, this would be one book that deserves reading. The writing, as with any of Jack McDevitt's books, can be a trifle dense at times, but I never found the story boring or tedious; nor was it bogged down with extraneous tangents as can often happen with science fiction authors wanting to explore the entire universe in 250 pages. Deepsix is the second of McDevitt's Academy series, following The Engines of God. I can say that without having read the latter, I didn't find it difficult at all to get into this story. It stands on its own merits. Of course the story does skim the surface of what happened in TEoG, and now I want to read it much more.